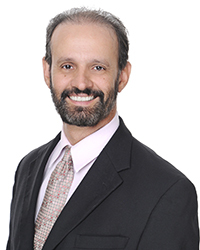 Dr. Carlos Emílio Ladeira is a physical therapist and educator who has experience in the United States, Canada, and Brazil. He has been teaching for more than 18 years. He was an associate professor at Nova Southeastern University before he joined the University of St. Augustine. He also practices physical therapy at Holy Cross Hospital in Ft. Lauderdale, Florida. His clinical experience spans 30 years at private clinics in Florida; Edmonton, Canada; and Brazil. He is a peer-reviewer for the Internet Journal of Allied Health Sciences and Practice, and has served in that capacity for Physiotherapy Canada and the Journal of Patient Related Outcome Measures. He has been published in the peer-reviewed Journal of Orthopaedic and Sports Physical Therapy, Spine, Journal of Manual & Manipulative Therapy, Brazilian Journal of Physical Therapy, and Journal of Strength and Conditioning Research. He has been invited to present on several topics at the International Congress of Physical Therapy and National Brazilian Congress of Musculoskeletal Manipulative Therapy. In 2001, he received the OPTP award for Excellence in a Published Review of The Literature from the Journal of Manual and Manipulative Therapy for his contribution to the body of knowledge of orthopedic physical therapy. He is a fellow of the American Academy of Orthopaedic Manual Physical Therapists and has earned a Manual Therapy Certification, both of which were completed at the University of St. Augustine. He is also credentialed by the American Physical Therapy Association as a Board Certified Orthopedic Clinical Specialist.